All form notifications are coming from "Jotform" instead of the specified field. 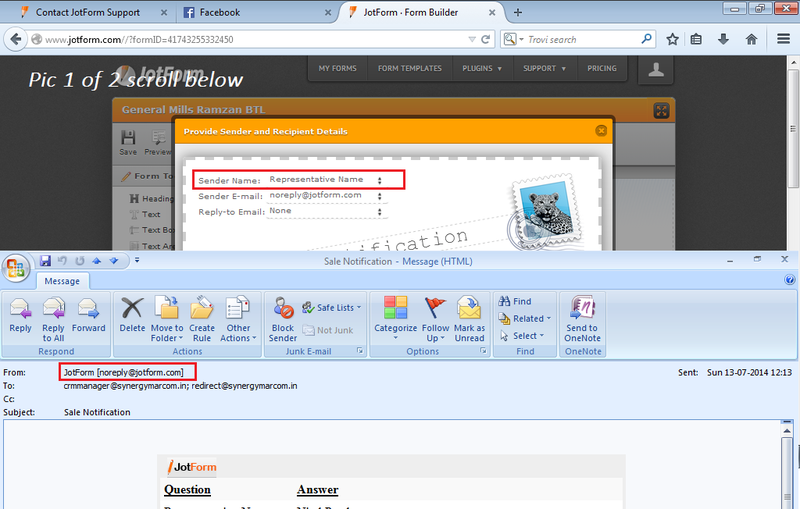 I am using your form, all notifications are specified through a field we have designated however, as default we are getting notification from "Jotform". I have attached an image for your understanding. Please help us fix this as the earliest as this malfunction is causing us a downtime in a project. Is this started happening suddenly? Can you tell me exactly when it started happening? Can you tell me the date & time for the last submission that came correctly and the date & time for the first submission that came incorrectly? Hi - I have just submitted exactly the same question - sorry didn't see this question. Thanks. We will look into this problem and get back to you. Hi @synergymarcom - are you guys still having this issue? When I tried to clone your form and made a test submission. I'm getting the proper senders name. Please look at the image below. Please let us know so that we can further assist you. @lisakash - glad to know that it works fine now. I will now close your other thread btw.